There are several types of drawer boxes available to consumers. Through the years, we have tried different styles of drawer boxes and have fine-tuned how our drawer boxes are built and our end product standard. Dovetail drawer boxes are generally considered a higher quality drawer box than more traditional types of drawers for many reasons. They have even been found in the tombs of ancient Egyptian mummies and Chinese emperors. The biggest benefit of this type of drawer box lies within the joints. The locking joint used in a dovetail drawer is built by cutting “wedge” shaped channels, called tails, into each side of the drawer box. These tails are then interlocked with the tails from the other drawer parts to form the shape of the box. Once each side is added and the box shape is made, these joints become very strong and resistant to wear and force. Another reason for its strength is the surface area created within the dovetails. More surface area equals more glue. More glue equals a stronger bond and stronger joint. But how are our dovetail drawer boxes any different than any other woodworking company out there? Put simply, we want to provide our clients with the best possible product. This includes the things they can’t see. We take the extra time to ensure those joints fit perfectly at every angle. On the top of the box sides and joints, and on the bottom. We take the time to ensure their construction is not only the most durable construction out there, but also to ensure it is clean, attractive, and of equal quality to what our clients do see. 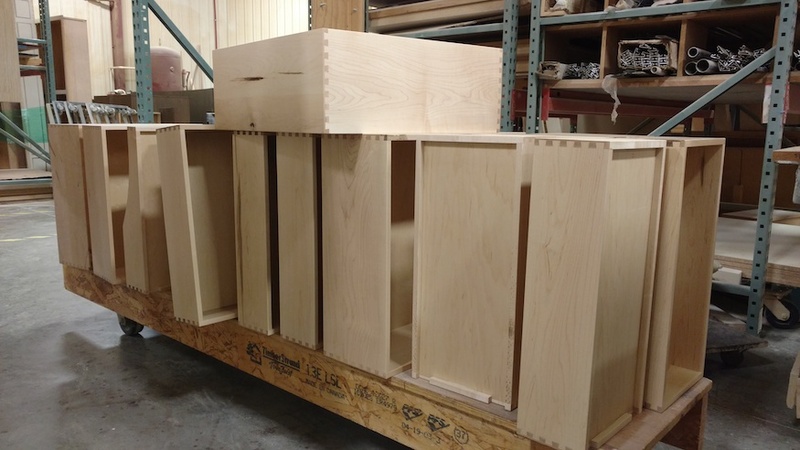 Our drawer boxes are constructed from one of two species of wood: Baltic Birch or Hard Maple. Both species are very hard, which means they are very, very durable. With some of the more advanced technology we utilize in the shop, you would think we just throw the material on our CNC router, push “Go” and have several drawer boxes worth of parts a few minutes later. But because we only construct our boxes out of Baltic birch or maple, we need to take special care to ensure they are machined properly. 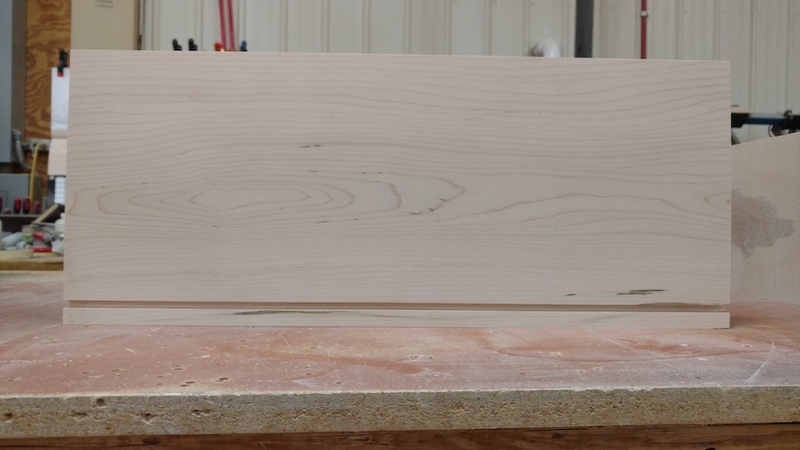 Baltic birch and maple are so hard that running these parts on a router can cause tear outs and burns in the material, and can have a significant dulling effect on our cutting edges, so we only cut these parts on our panel saws. It does take more time, but cutting these materials on our panel saws ensures we achieve the cleanest cut and most durable product possible. 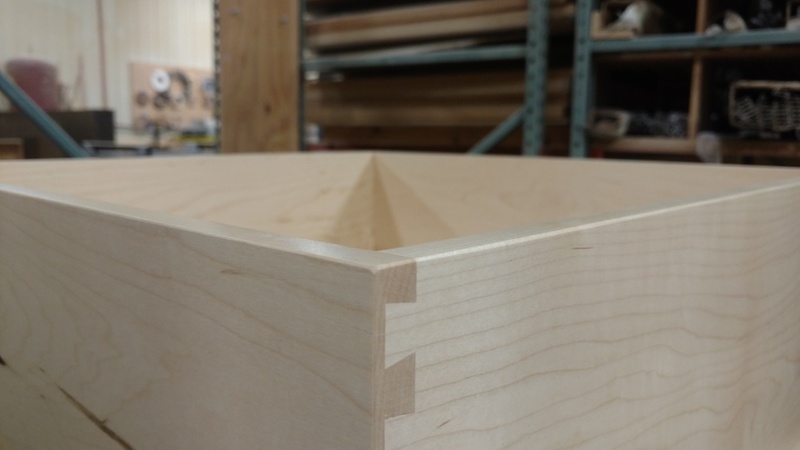 Dados are square or rectangular grooves that are cut into a piece of material that another piece of material rests in – it’s another type of joint we use in drawer boxes. They are often used to hold shelves in a bookcase, to attach backs to cabinets, or to hold bottoms in drawer boxes. In this instance, once the dado is added to the drawer sides, the bottom is slid into the dados where it will rest once the box is finished. 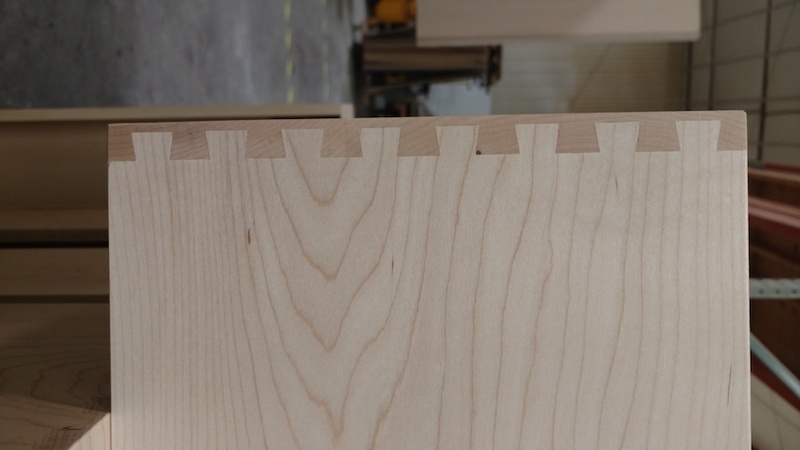 In milling dados, we like to cut it about 1/3 the thickness of the material to keep enough material around the joint which keeps its structure sturdy. The width of the dados are made to fit the thickness of the material that will be sitting in it. 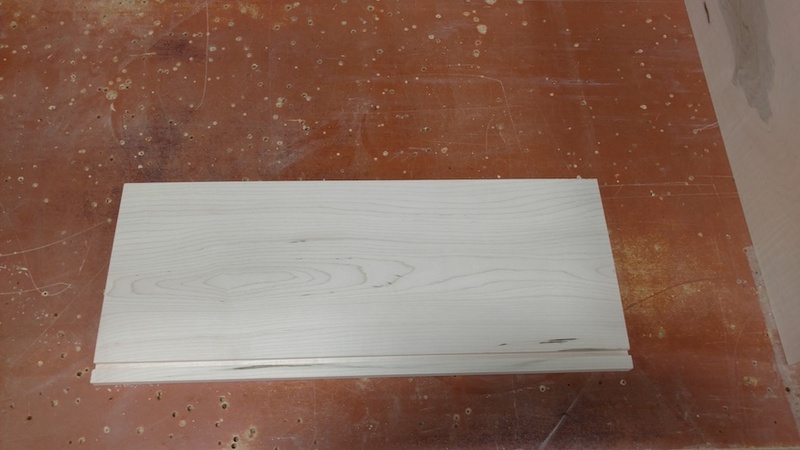 Dados can be made using a handheld or table-mounted router, or on a saw with a dado blade and fence set to the proper specs. Often times, the material we use for the drawer bottoms is thin enough that we can just cut the dado for the thickness of the bottom material. However, there are times we need to use the thicker bottom material. In this case, we need to also cut rabbets – a “tongue” of sorts – into the drawer bottoms in order for it to fit into the dados. There are several ways to cut the dovetail joints. They can be cut by hand – as they have been for thousands of years – with a table saw, or with a router and jig. And not surprisingly, there is also machinery out there created solely for cutting dovetails. One of our favorite pieces of machinery is our Dodds Dovetail Machine. It features a single spindle and automatic feed. The dovetailer allows us to enter each part thickness and how many dovetails we want on each part and then press “Go”. The machine does it all very accurately and efficiently, and we find ourselves with drawer sides, fronts, and backs that fit together perfectly – flush with no gaps, overlaps, or mismatched joints. Once all the drawer parts are machined, we sand each individual part. Sanding each part before assembly helps the assembly process move along quicker. It also allows us a little extra time in assembly to make any fine-tuned adjustments, if need be. After the parts are sanded, they move to the assembly where we apply glue to all the joints (remember dovetails = more surface area for glue = stronger bond and durability). The dovetails are fit together on three sides of the box, the bottom is affixed within the dados, and the last side of the box is then put into place. From here, we look and feel the box over, ensuring each joint is smooth and fits perfectly. This includes the tops and bottoms of each side and corner. At last, the completed drawer box moves on to finishing and is then ready to be installed in its cabinet! Stay tuned for more woodworking tips, tricks, jigs, and techniques coming soon. In the meantime, view some of our recent work in our gallery.